With more than 21,673 MW of wind power installed, more than 19,450 wind turbines are operating in Spain, grouped among 930 wind farms. Installed wind energy capacity in Spain reached 21,673 MW in 2011 with the addition of 1,050 MW, according to the Spanish Wind Energy Association’s (AEE) Wind Observatory. Smaller growth was expected for 2011 after the increase of 1,515.95 MW in 2010. 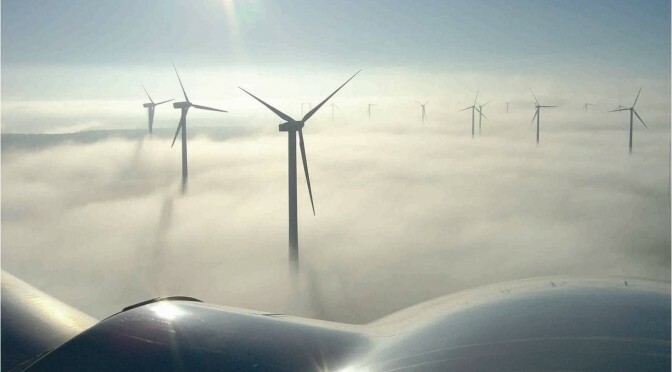 Spain is the fourth country in the world in terms of installed wind power capacity and produced 41,799 GWh of electricity from wind turbines in 2011. The mandatory Pre-allocation Register established by the Spanish central government has slowed wind energy deployment since 2010. As a result, the percent increase in capacity has been declining. The addition of 1,050 MW in 2011 represents an increase of 5.1% compared with a 7.9% increase in 2010. Electrical energy demand decreased 1.3% from 2010 to 254.78 TWh. Wind energy met 16.3% of this demand and was the fourth largest contributing technology in 2011.
plants (19.8%) and coal (17.0%). During 2011, the government implemented new decreases to incentives for wind energy. The wind sector must share the burden of helping the country reduce its subsidy bill for green energy. However, lobbyists are arguing the 2020 target will not be achieved if the bill is passed. The draft bill sets rules for wind farms from 2013 onward and proposes a system of variable premiums. These premiums will diminish for capacity installed each year in excess of the annual target of 1.4 GW (required to reach the 2020 target of 35 GW). For the first 1.4 GW, all producers will receive a 20 EUR/MWh (26 USD/MWh) premium over market prices. The guaranteed floor price will decrease from the current 55 EUR/MWh to 77 EUR/ MWh (71 USD/MWh to 100 USD/MWh), and it will be reviewed annually. The draft decree also limits subsidies for wind farm projects to 12 years compared with the previous projects. Developers would receive premium payments only during the first 1,500 operating hours each year.Finally, premiums will not be revised in line with inflation. The AEE warned that these measures will introduce a level of volatility into support levels that could make financing projects impossible. It claimed that the proposed measures will result in a 40% reduction in support for wind farms installed after 2012. Wind sector developers and investors in Spain, and across Europe, will be waiting nervously over the coming months to see whether the draft decree will be passed. The government deferred decision on the draft decree to the new government elected in November 2011. The conservative party won the elections and the first decisions will be how to end the national deficit created partially by the feed-in tariff system. A new law will likely come early in 2012. During 2011, the Spanish wind sector installed about 1,050 MW, the lowest figure since 2000. Possibly the worst news for the sector, whose projects need from three to five years to mature, is that after December 2011, it is unclear if new projects will receive any feed-in tariff. This uncertainty will stop the installation of new wind farms for several years. On 11 November 2011, the new Renewable Energy Plan (REP 2011-2020) was approved by the Spanish government for the years 2011 to 2020, establishing the development framework for the renewable energy sector. for each type of renewable energy. The public entity charged with implementing the REP 2011-2020 is the Institute for Energy Diversification and Saving. For wind energy, the objective for 2020 is 35,000 MW. Offshore wind power is still in the early stages of development, with R&D projects being carried out. (71,540 GWh/yr) onshore and 750 MW (1,845 GWh/yr) offshore. The REP 2011-2020 includes 87 measures, half of which are sector-specific. Activities for the planning, promotion, information, and training. The electrical generation capacity in the Spanish mainland system increased more than 1,879 MW during 2011 for a total of 100,176 MW, according to the Spanish TSO Red Eléctrica de España (REE). The technologies that contributed most to this growth were wind (1,050 MW) and solar power (674 MW). With more than 21,673 MW of wind power installed, more than 19,450 wind turbines are operating in Spain, grouped among 930 wind farms. The average size of an installed wind farm in 2011 was 26 MW. Wind energy is present in 15 of the 17 autonomous communities). Castilla-Leon has the most installed power among them, with 5,233 MW. This autonomous community has had the biggest growth with 462 MW added in 2011. The Valencian Community experienced 18.5% growth, the second biggest, with 183 MW installed in 2011. It has 1,170 MW of wind capacity. The third biggest growth has been in Cataluña with 18% (154 MW new) reaching 1,003 MW total. Then Andalucia with 92 MW (3.1% growth) reaches 3,367 MW. wind capacity. With only 26.5 MW of new capacity installed in 2011 in Castilla-La Mancha region, it stays in second place with total capacity of 3,737 MW. Castilla-La Mancha is followed by Navarra, which added just 8.5 MW for a total of 977 MW. The Canary Islands added 1.8 MW for a total capacity of 146 MW. Despite having their respective development plans approved, the two communities of Galicia and Cantabria have not increased their wind capacity due to different political reasons. 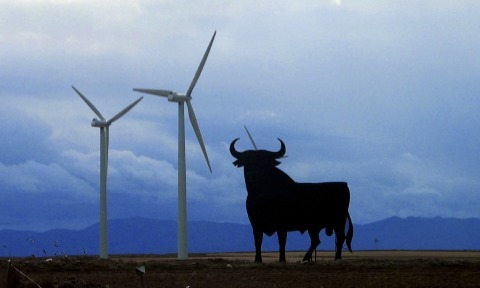 Only two autonomous regions, Extremadura and Madrid, have not yet installed any wind power capacity. However, they have advanced projects and regulations to start wind energy activities, especially in the Extremadura region. Unlike many countries with significant wind development, Spain has increased its distribution throughout the country. The use of wind power has lowered CO2 emissions by about 22.5 million tons during 2011. Furthermore, wind generation has saved up to 8.3 million tons of conventional fuels and has supplied the electrical consumption of more than 13.1 million Spanish households. 1) A regulated tariff scheme: payment for electricity generated by a wind farm is independent of the size of the installation and the year of start-up. For 2011, the value was 79.08 EUR/MWh (94.84 USD/MWh). The update was based on the Retail Price Index minus an adjustment factor. 2) A market option: payment is calculated as the market price of electricity plus a premium, plus a supplement, minus the cost of deviations from energy forecasting. There is a lower limit to guarantee the economic viability of the installations and an upper limit (cap and floor). For instance, the values for 2011 are reference premium 20.142 EUR/MWh (24.170 USD/MWh), lower limit 76.975 EUR/MWh (92.37 USD/MWh), and upper limit of 91.737 EUR/MWh (110.884 USD/MWh). A new order ITC/3353/2010 established the access fees from 1 January 2011 and the rates and premiums (feedin tariffs) for the wind installations included in the RD 661/227. kW). This new act will be decisive for the development of small wind generation for the owners’ use. To facilitate the economic feasibility of these small generators, a new net balance based support scheme is under development. During 2011, the largest manufacturers were Gamesa (461.15 MW new capacity), Vestas Wind Power (207.4 MW new capacity), GE Wind (163.44 MW new capacity), Acciona Wind Power (102 MW new capacity), Alston Wind (68.11 MW new capacity), and Siemens WindPower (48 MW new capacity). Gamesa is still the top manufacturer in Spain with 11,510.16 MW total wind capacity installed (53.1% of the total wind capacity installed). In the second position is Vestas Wind Power with 3,733.49 MW total wind capacity installed (17.2% of the total wind capacity installed), and Alston Wind moved into third place with 1,629.54 MW (7.5% of the total wind capacity installed). The Spanish manufacturer Acciona Wind Power is in the fourth position with 1,556.13 MW (7.2% of the total wind capacity installed). Several manufacturers are developing small wind turbines from 3 kW to 100 kW for grid-connected applications, and two manufacturers are working on mid-sized wind turbine prototypes from 150 kW to 300 kW (Electria Wind And ADES). Iberdrola Renovables, the largest Spanish utility, has the largest accumulated capacity (5,327.65 MW) thanks to the addition in 2011 of 101.08 MW. However, the company installed more than 1,059 MW outside of Spain in 2011. Acciona Energy, in second place, has accumulated capacity of 4,164.32 MW with 127.50 MW installed in 2011. Also, this Spanish developer installed around 524 MW in other countries in 2011. The number of wind turbines in Spain increased by more than 580 in 2011, and the total number of wind turbines is more than 19,606 units. The average size of a wind turbine installed in 2011 was 1.8 MW and the average size of the total installed capacity is 1.1 MW. Wind turbines operating in Spain show important seasonal behavior. Annual electricity generated by wind farms was more than 41,661 GWh. During 2011, equivalent hours at rated power were slightly higher than 1,800 hours for all of the wind farms. This shows that 2011 was not a good wind resource year overall. However on several occasions, wind power exceeded previous historical instantaneous power peaks and maximum hourly and daily energy production. On 6 November 2011 (2:00 am), 59.6% of total power demand was covered by wind energy. In spite the price increases for some raw materials used in wind turbines, the increased use of large wind turbines (2 MW of nominal power), the excess of available main components, and the current limited demand for wind turbines, prices for wind generators have decreased. The official cost at the factory during 2011 in Spain was about 820 EUR/kW (1,000 USD/kW). Authors: Ignacio Cruz and Enrique Soria, Centro de Investigaciones Energéticas Mediaombientales y Tecnológicas (CIEMAT), Spanish Ministry of Economy and Competitiveness, with the collaboration of the Spanish Wind Energy Association (Asociación Empresarial Eólica (AEE), Spain.